Wholesale buyers, on which the work of our production association is oriented, can independently choose the length of parts for their own convenience, cutting the St. George ribbon in a roll. This allows using the entire length of the material more rational, increasing its own profit without additional investment. To meet the needs of the customer, our company is engaged in the manufacture of St. George ribbon made of polyester yarns, which are highly resistant to external influences: they do not burn out under the sun, retain its shape and bright colors under the rain. The width of the products is 24 mm or 35 mm. 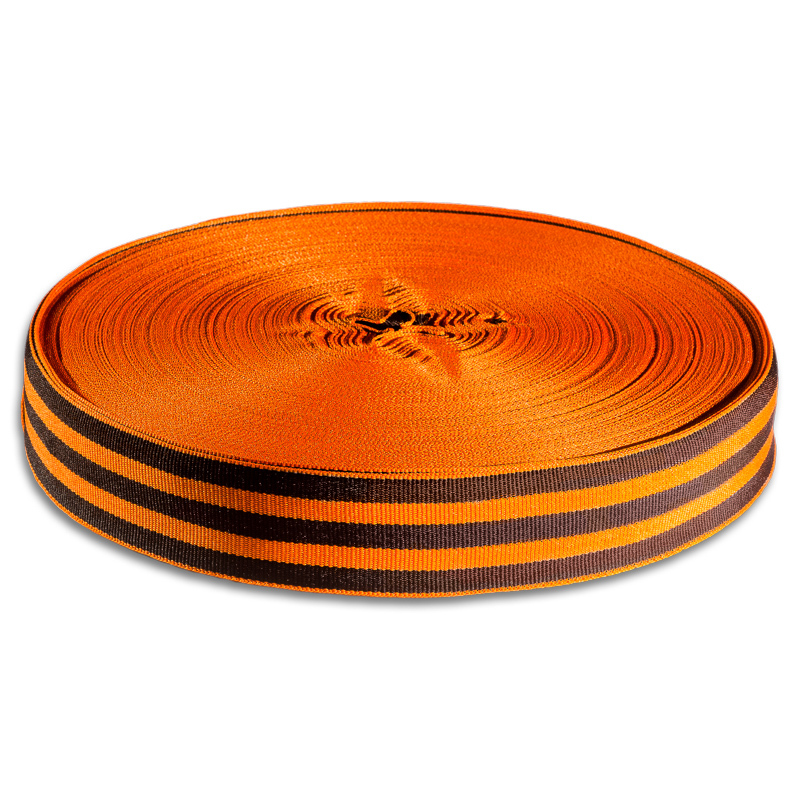 The length of the roll is 50 m.
The thickness of the orange and black stripes located in the middle of the ribbon is 4.5 mm or 6.6 mm. Orange stripes, located at the edges is 1 mm. Thermal treatment of the ends of the fabric provides a reliable connection of the edge threads, preventing the formation of fringe. Customers are invited to buy St. George ribbon roll in any quantity. Own equipment, extensive production experience and professionalism of employees enable us to ensure the production of the batch of the required size in the shortest possible time. Stability of ribbon coloring to weather conditions corresponds to GOST 9733.2-91 (ISO 105-B03:1994). Stability of ribbon coloring to light exposure corresponds to GOST 9733.2-91 (ISO 105-B03:1994) not less than 4 points on a 5-point scale. The ribbon edges are thermally treated to prevent material from dissolving and fringe formation at the ends of the product.